I'm not a big golfer, but many people in my family play the sport, so I'm constantly surrounded by golf equipment and lingo. 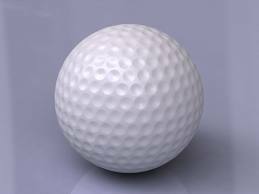 I've always wondered why the golf balls being used have "dimples" on the surface. See in the picture. In a mathematical/scientific explanation, how/why do the dimples on the surface of the ball provide better aerodynamics for the ball? If someone could give me an explanation on how the technology actually works that would be awesome. You are correct that this has to do with aerodynamics, more specifically drag and air friction. This article goes over all of the specifics. Ultimately, it boils down to less drag on the ball, allowing it to fly farther. The exact details and an explanation of the difference between a smooth sphere and a dimpled ball are included in the linked article. The following image shows the difference between a smooth sphere and a dimpled ball. The smooth sphere separates the air rapidly, creating a large pressure differential between the front and rear of the ball. This creates a large wake that creates lots of drag, forcing the ball to descend more quickly. 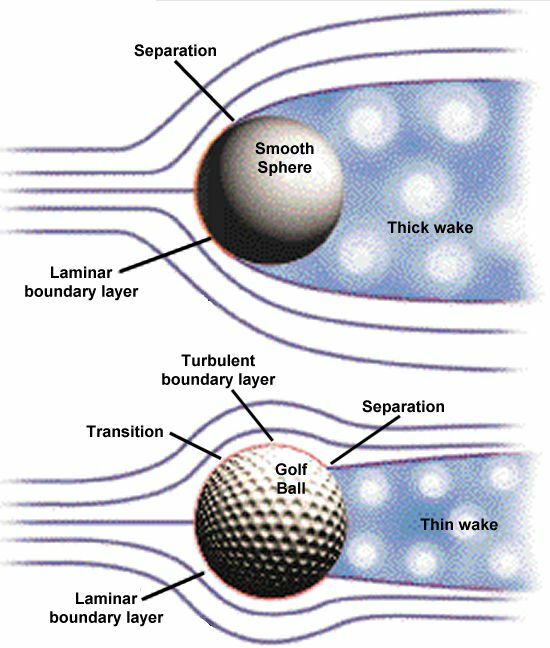 In contrast, the dimpled ball delays the separation of the air, reducing the size of the wake. This helps to also reduce the pressure differential between the front and rear of the ball, reducing the drag and subsequently allowing the dimpled ball to fly farther than the smooth sphere. Why is the bottom surface of water skis smooth?